No, that's not a really long glowstick-necklace-thingy. 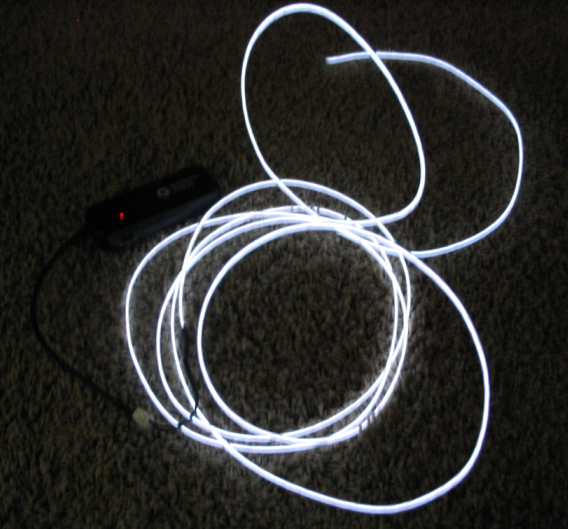 It's a battery-operated glowing electroluminescent wire! 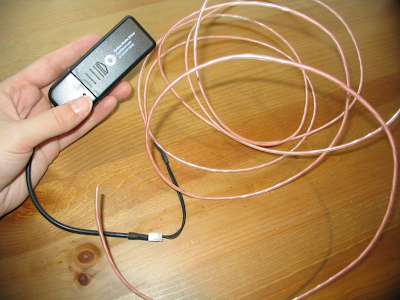 EL wire = Electroluminescent wire. Like glow sticks, only better! This stuff is pretty awesome if you want to light up a costume or prop (TRON, anyone?). The wire can be cut, it doesn't get hot and it's flexible and movable and reusable. Hook it up to a little battery pack with a switch and imagine the possibilities! I picked up a white 10-foot set with the techno strobe switch (it has three settings: on, off, and strobe). The wire itself comes in lots of colors, can be cut to any length, and now there is even EL tape (like a wider tape strip instead of a wire). This stuff a little hard to find since it's a relatively new product on the market. Fortunately I found a guy in Seattle who sells it. He said he'll be at Norwescon next Spring too. It sounds like a lot of people are using this stuff for costumes (and Norwescon is all about the costumes).